The Shaniwar Wada fort in Pune, which covers about 625 acres, was constructed by Peshwa Bajirao I, as the abode of the Peshwas. It served as the loving home of Bajirao I and Kashi and is also significant for the valuable cultural history of India. You shall be wonderstruck at the beautiful forts and fountains it has and the magnificent statue of Baji Rao I, which adorns the entrance of the fort is quite praiseworthy. However, the fact that it is considered one of the most haunted places in Pune cannot be ignored. The fort has suffered various military attacks and is in the state of ruins. Then in 1818, it was taken over by the British as soon as the Third Battle of Panipat had come to an end. It is sad, however, that in the very first year itself in which it was built, the fort, unfortunately, bore witness to the demise of Peshwa Bajirao I, his unfaithfulness towards his wife Kashi and the love story of Bajirao-Mastani which remained unfinished. The main reason for tourists eagerly wanting to visit the fort is because of paranormal activities. The spookiness is quite attractive to the crowd who are leaving no stone unturned to plan a trip here. The magnificent fortification which was planned to be entirely built in stone was objected by the people on the grounds that only kings had the authority to build stone palaces. Thus, six out of seven floors were built with bricks and only the ground floor comprised stones. The six floors were destroyed by the British empire about ninety years later and the enchanting palace had only the base floor remaining to reminisce of the memorable past. On 27 February 1828, it went up in flames which crumbled the entire palace leaving behind granite ramparts and the ruins of the building along with a few sturdy teak gateways. 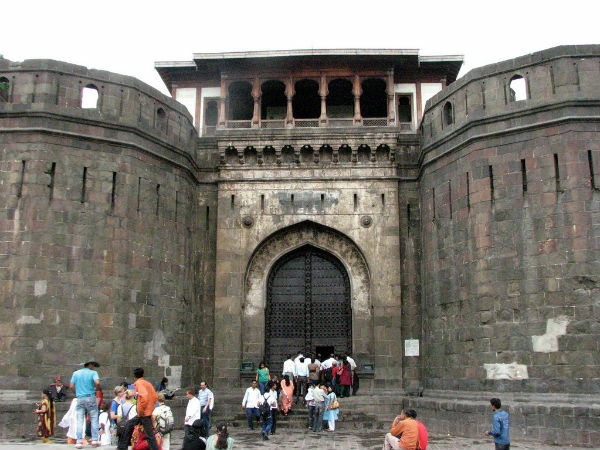 The seven-storeyed fortress is located centrally in the very heart of Pune. You can commute via local transport such as autos, taxis and buses. The Pune Darshan buses shall also merrily tell you to hop along towards Shaniwar Wada. 10 January 1730 saw the inauguration of Shaniwar Wada which was derived from the Marathi words Shaniwar (Saturday) and Wada (residential complex). Jungles of Junnar contributed the teak for building purposes whereas the lime came from the lime belts of Jejuri and stone was also used. The walls depicted the scenic beauty of the epics the Mahabharata and the Ramayana while Persian rugs decorated the glorious marble flooring. The Ganpati Rang Mahal is difficult to miss as it was another significant site for all religious celebrations of the Peshwas and was blessed with a gigantic statue of Lord Ganesha. Presently, you can observe nine bastion towers, a garden complex and various gates, namely the Dilli Gate, the Mastani Gate, the Khidki Darwaza, the Ganpati Gate and the Narayan Gate. What shall attract your attention the most is definitely the sixteen-petals lotus-shaped fountain which is a symbol of the lovely times of that era. It is also known as Hazari Karanje which has the power of a thousand sprays or jets. You can spot a cannon or two: one while you enter and another inside the fort. This is undoubtedly the most interesting part of the article which shall give you goosebumps. The main characters pertaining to this story are Peshwa Narayan Rao, his ruthless uncle Peshwa Raghunath Rao and his evil wife, Anandibai. Tired of his uncle's controlling nature and undue dominating streak over the empire, Peshwa Narayan Rao put him under house arrest. Peshwa Raghunath Rao wanted to seek revenge and thus ordered 'Narayan Rao la dhara' which meant 'Hold Narayan Rao'. But before the guards could get hold of this which was the original message, his cunning wife tweaked the message to 'Narayan Rao la mara' which is clearly interpreted as 'Kill Narayan Rao'. This led to the cold-blooded murder of Peshwa Narayan Rao by the guards. He had no means of escape and helplessly cried out to his uncle for help and scurried around the fort yelling "Kaka mala vachva" which meant "Uncle save me!" His spot of death is said to be possessed by his spooky spirit who still moans for mercy as is heard by the neighbouring people on some nights. Especially on full moon nights. Thus, people are usually barred from entering the place after 6:30 pm to avoid heart-wrenching encounters with the ghost. He was savagely cut into pieces by his murderers and thrown into the river. If you think you are brave enough, why not give the place a try? It is one of the most famous attractions which takes place in the heart of the Wada. It depicts the entire journey of Shivaji's era through a beautiful projection of vibrant lights and mesmerizing images over a water fountain. The show takes place in both Hindi, Marathi and English. You can step foot into the haunted fortress anytime between 8:00 am and 6:30 pm. It is only INR 5 for Indians but a little costly for the foreign tourists (INR 125). However, you have to pay separately for the light and sound show. Timings for the show in English is from 8:15 pm to 9:10 pm. Tickets can only be purchased on the spot and there is no provision for online booking. So, are you ready for a ghostly adventure?